The importance of travel insurance: when things go wrong is something we never want to think about. Vacations are supposed to be wonderful times with family and friends. Vacations are supposed to be exciting times. Sadly, life throws us curve balls. Even bad things happen to good people, even on vacations. What happens when the worst case situation happens, such as a death of your love one overseas? The last thing you want to worry about is all the hassles, government red tape, and frustration of finding an airline to fly the body of your love one back home. You are already stressed enough with the loss of your love one. No matter how hard it is you will for sure bring your love one back home, no matter what the cost! 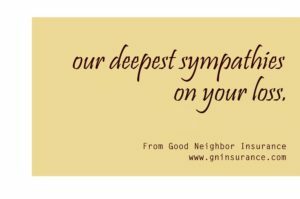 Here at Good Neighbor Insurance we do understand. Since being in business since 1997, we have seen how international travel insurance provides you peace of mind, even in the darkest hours of your life. This NY Times article at http://www.nytimes.com/2016/08/11/world/africa/safari-tour-guide-kenya.html?_r=0is is a sad story of a tourist who was in Kenya and killed by the safari guide. Any unfortunate death is sad. There is no good in that type of death for sure. But we can help loved ones, whether in the U.S., China, or any country minimize the stress of bringing their love one’s body home for a proper funeral. All of our travel insurance plans at https://www.gninsurance.com/international-travel-health-insurance-plans/ have many travel insurance benefits including return of mortal remains. This coverage is amazing because it allows you to let the international insurance company work with you on bringing your love one home. For U.S. citizens and non-U.S. citizens traveling throughout the world our Patriot International insurance at https://www.gninsurance.com/patriot-short-term-travel-evacuation-plan/#patriot works perfectly. Another great travel plan for our U.S. residents traveling outside the U.S. is our Diplomat International plan at https://www.gninsurance.com/diplomat-international-travel-medical-insurance/ which includes sports coverage also. We pray that nobody passes on when they are outside their country of resident / citizenship. Sadly, bad things do happen to good people. Call one of our licensed travel insurance agents at Good Neighbor Insurance at 866-636-9100 or our Arizona phone line at 480-633-9500. Have fun and safe travels! From your GNI travel insurance team in Phoenix, Arizona.